This was not my first visit to Holy Cow, the vegan cafe on Elder Street. I’d popped in a few months ago and been a little baffled by their approach to menu design which featured descriptions comparing their offering as vegan equivalents of bacon sandwiches, fish burgers and the like. I’d tried the “fish burger” which was a piece of celeriac prepped to give it an oddly flaky texture. It was unevenly cooked and while not a complete disaster rather in the realms of an unsuccessful experiment. I thought I’d give it another go and was delighted to see much more straightforward descriptions on their new menu which made a clearer virtue of their vegan approach. 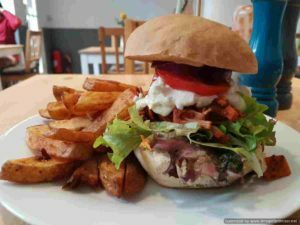 Their offering has soups, salads, burgers and sandwiches to the fore. I was keen to give their pulled jackfruit a try so ordered that burger. It came with chunky fries. They’re cooking to order so things took a moment or two to arrive. When it did it looked monstrously good with a gigantic portion of chips. Jackfruit takes on smokyness really well and has a slightly fibrous texture making it rather like pulled pork in style. The homemade bun had just about enough integrity and the rest of the burger elements were very good indeed. It’s comfortably the best vegan burger I’ve been served in the city so think it just about deserves a place in the Burgerquest exceptionals. The chips were solidly decent too and such a generous portion. It was a very good plate of food that chased away lunchtime hunger in good style. 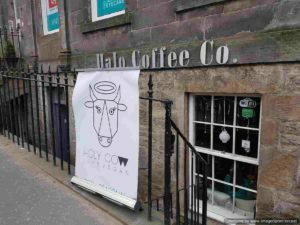 So overall, it was good to see Holy Cow settled in to a very good standard and much improved from the slightly shaky start they were having when I first visited. They really need to take down the exterior signage from the previous cafe occupants to give things more of a sense of permanence but once this is sorted they’ll have locked up a very strong and much needed vegan niche.